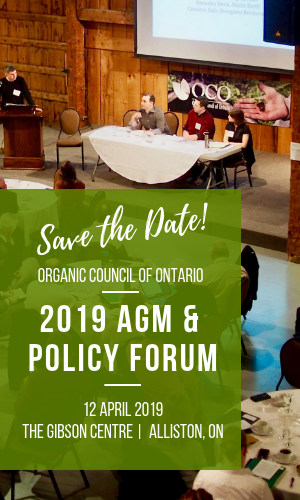 On Saturday, February 16th, Canadian Organic Growers, or COG, hosted its annual Organic Consumer Conference along with the Big Carrot in Toronto. The event brought together consumers, organic farmers from across the country, organizations working for a sustainable food system, scientific researchers, documentary film makers from Canada and elsewhere, and more. Perhaps the most awaited presentation was that given by Professor Eric Seralini who is known around the world for his recent research on GMOs, RoundUp and rat health, which has received attention from both GMO critics and supporters alike. His latest research showed the negative impact even small amounts of RoundUp, by far one of the most heavily used pesticides in North America, can have on rat health. Rats were found to develop tumors and key organ failures over time. “We are in favour of controlled genetic engineering such as the use of insulin or growth hormones”, stated Professor Seralini, “but we are not in acceptance of using our bodies or soils as benches for molecular biology. We are living in the Middle Ages when it comes to how pesticides and GMOs are regulated”. Professor Seralini told the room how he and his research team had been to court numerous times to fight for more transparency in how pesticides and GMOs are approved. In Canada and elsewhere, companies applying for GMO approvals perform their own research on the safety of their products, which is not available for public review and held as ‘confidential business information’. According to the Professor, it is a shame that in the 21st Century it is not mandatory for tests no longer than 3 months in duration to be performed to assess the safety of products used to grow our food. mandatory tests over the entire lifespan of rats for all genetically modified products. The event brought together both Canadians and international guest speakers – showing that the issue of building a more sustainable food system is not limited to Canada alone. OCO raised the point, echoed by other presenters, that choosing to buy organic no matter where it is produced is in fact helping to stop the use of pesticides in other places. OCO interviewed Dr. Seralini along with Dr. Ann Clark and youth activist Rachel Parent (Kids Right to Know) following Dr. Seralini’s presentation. Audio/ video of that conversation will be made available on the OCO website and Youtube channel after March 1st. Of particular importance was our conversation on Co-Existence Strategies for RoundUp Ready Alfalfa specifically and GMOs in foods generally.